I'm not sure if this is the best forum to put this in, and I know Paul and I are the only two (so far) to own this tome, but in just the little bit of time I've had it, I feel I've learned a lot, and I'd like to share some of the insights I've gained with you all. I could never do his extensive research justice, but if there are tips, etc., that seem worth sharing, I'll do it. For example, his way of cooking Napoletana pizza doesn't involve a stone. You use a reasonably thick piece of metal (either stainless or aluminum) as your cooking surface, as it radiates heat better (although you need to find the "sweet spot" of your oven for heating...most likely the top shelf). With a combo of the heated plate and the broiler you can achieve something almost akin to the 800 degrees a pizza oven can, and, because the cooking isn't relying on circulating hot air (but heat coming up from the plate, and down from the broiler), you could actually leave the oven door open during cooking. This method allows you to cook your pizza in two minutes...as he says, sort of the max they do in Naples. I'll be interested to try this. I would love to own this book! But alas the budget doesn't accommodate it. Please do keep posting; I love picking up tidbits from you and Paul. 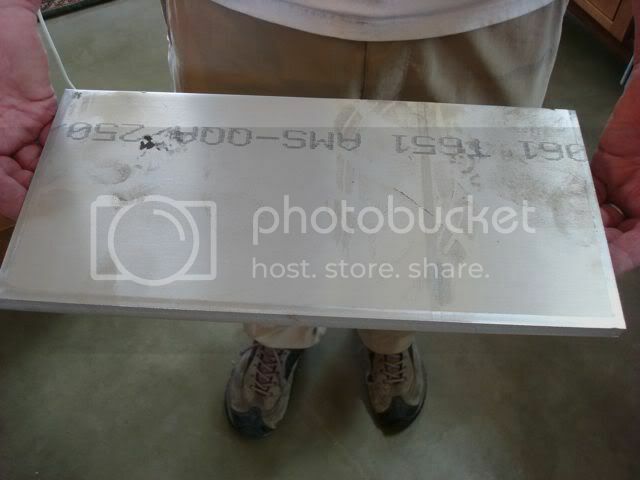 Just ordered a piece of aluminum to fit my oven. Fairly cheap (about $40), so I look forward to trying this method. Just curious but do you think a gas salamander would do the job in place of an oven's broiler? My oven is working well at the moment, but historically when I have used the broiler, I'd lose the cook top. The temp would melt something or cause some connection to go haywire and I'd be on the phone to the service outfit. Now, it is no longer in warranty, but to make matters worse, the service outfit closed. No one to work on it in the city if it goes kaput. I have considered doing something similar but using cast iron. Heston B used a cast iron skillet to do something similar to Amy's description in his "In Search of Perfection" series, heating the skillet as hot as possible and then tucking under his oven's broiler. But if I could find a nice used smallish salamander, propane or natural gas fired, since that's what we have here. Maybe it would work? Cast Iron or Steel would be fine. Aluminum makes me nervous since it's melting temperature is close to that found in a traditional pizza oven. If I managed to get close to those temperatures, I'd hate to have some globs of metal falling off the bottom plate. Okay, thanks for the pointer, Amy. I will keep looking at that. Now I'm dusting off my pressure cooker for sauce making and considering the dough, which I usually make with a poolish or biga. But I think I will give Heston's recipe a try. Myhrvold says a cast iron skillet could work in a pinch, and I think a salamander would work great. It actually may work better than a broiler. We picked up my (more expensive than quoted) piece of aluminum today, and as you would expect, it was rough...sharp edges, etc. So, Andy did his magic and I now have a beautiful new pizza "stone". I forgot to photograph what the piece looked like prior to Andy's magic, but here's a scrap piece they gave us from the cutting. And, here's the magic Andy worked on the final piece. We decided to wait until tomorrow to try the pizzas as we are doing a major hike with friends, and pizza is easy relative to other things, so we'll appreciate the ease of prep after a long day of climbing mountains. 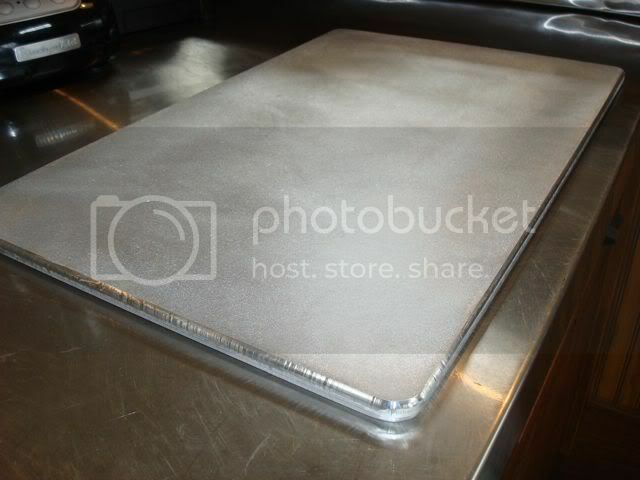 Do you think an upturned aluminum cookie sheet would give me a similar effect? I really love very crisp thin crust pizza and the stone is okay, but I wuld like it a bit crispier. The technique depends on having a lot of thermal mass which very rapidly transfers heat to the pizza. A cookie sheet won't have enough mass to get the job done. Paul, thanks, I will keep my eyes open as used equipment shows up here occasionally, or more likely on one of our excursions to Manila. gardnercook, using a pizza stone or baking stone as a good heat sink, I've had success in making a pretty crispy pizza. I actually fabricated my pizza stone out of half height building bricks in an aluminum frame. We crank the oven up to high (450F - 475F maximum). To minimize sogginess from the sauce and toppings, we do a pre-bake for 5 to 8 minutes. As the dough cools we give it a quick egg wash. (Amy has mentioned this seems overkill - but it works.) We can either prep/top the pizza for immediate cooking or store the untopped pie in the freezer for later use at this point. When finishing, using the pre-baked pizza dough, we only need to cook in the oven for 9 - 12 minutes depending on toppings and oven temperature. The egg wash seal, similar to sealing the crust of a dessert pie, really prevents the top crust from becoming overly soggy, and the thin pizza is quite crisp coming out of the oven. Not the two minute, super high heat solution that pizza aficionados including myself prefer, but it has worked in terms of fighting droopy pizza slices. I've now made pizza using my aluminum "stone" a number of times. I also had an opportunity last weekend to use the same technique with a regular pizza stone. (I was at my SIL's house in NJ and cooked each night for around 15 people...the last night I said "no sit down dinner, I'm making pizza.") She's got a run-of-the-mill oven (which I'm trying to get her to upgrade, as my nephew is a budding chef), and the technique of using the broiler worked really well. I made nine pizzas back-to-back, and the last came out as crispy as the first. This is now my "go to" method for baking pizza. On a side note, I use 00 Italian flour for all of my pizzas and so I bought some of the KA "Italian Style" flour at Whole Foods, as I don't exactly travel with flour in my luggage. Wow, it was so different than the Italian flour I regularly use. The dough was so sticky I couldn't shape it into balls. After some retarding in the fridge it was manageable, but I think I'll "stick" to imported Italian flour in the future. What is your source for the 00 flour? My nephew asked me the other day where to get some and I drew a blank and sent him to the internet and to KA (I guess that was a mistake).